During the last two years, every week or so, a little icon starts jumping up and down on the screen of my MacBook. This is Adobe Acrobat Reader asksing me if I’d like to upgrade it. Since I’m a polite person, during the first six months I was clicking OK. Please do. Sure, upgrade my free Acrobat Reader. During the last 18 months I was simply ignoring this request and was closing this little jumping icon. Two weeks ago, during Adobe MAX, Rainn Wilson from The Office was hosting a Sneaks event. 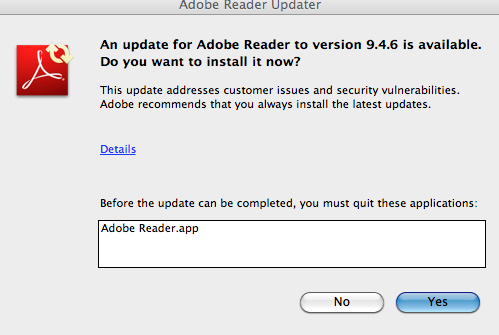 He started with asking Adobe to do something with this Update the Reader button. I knew exactly what he was talking about. Everyone laughed. 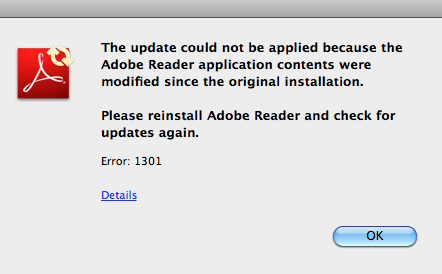 Dear Adobe, can you please find some cash and hire a good programmer who can fix this issue once and forever? If you think that I’m asking for too much, please turn this freaking update offer off, will you? Do it quick and, please, walk away! Update. A reader A.T. has hinted that there’s a configurable item Updater in the in the Reader’s Preferences, which allows to turn the automatic updates off. Thank A.T!